The Albuquerque Isotopes bolstered their bullpen with the addition of right-handed reliever Luis Vasquez. With starting pitcher Stephen Fife on recall to the Dodgers, the ‘Topes, who are in desperate need of fresh arms in the pen, filled the open roster slot with the 26-year-old Vasquez. The 6-4, 175-pound righty was moved from Double-A Chattanooga where he collected a 2-2 record with a 5.80 ERA through 45.0 innings of work. Vasquez has made spotty appearances through the early stages of the 2012 campaign, allowing four or more runs in short outings on three different occasions. However, the reliever has recently dialed in on the mound to surrender only five runs through his last 12 games (15 IP), and hasn’t given up a home run since May 26. Originally signed by the Dodgers as a non-drafted free agent on October 20, 2003 out of San Pedro de Macoris, Dominican Republic, Vasquez made his professional debut at shortstop for the DSL Dodgers in 2004. However, he struggled at the plate, hitting just .188 through 117 at-bats before being moved to the mound for the start of the 2005 season. The hurler then earned a 1-1 record through eight games (six starts) with a 3.25 ERA, but had his season cut short as he succumbed to “Tommy John” surgery. The Dominican Republic native missed the entire 2006 season recovering from “Tommy John,” but returned for the 2007 campaign with GCL Dodgers, appearing exclusively in relief. Vasquez was briefly added to the Dodgers 40-man roster in 2010, but was optioned to Single-A Great Lakes where we had arguably his best season of his career. Through 40.1 innings out of the pen, the right-handed reliever posted a strong 2.68 ERA while limiting opposing bats to just a .173 average. 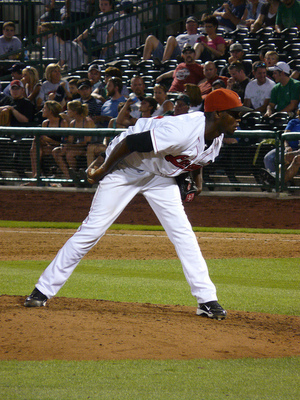 Following the 2010 campaign, the pitcher was ranked as the 30th best prospect in the Dodgers organization by Baseball America. While control remains an issue for Vasquez, 32 strikeouts to 28 walks this year, he has the ability to impress with a fastball that has topped out at triple digits. Vasquez will join the Isotopes before the first game in their series against the Nashville Sounds. A wide array of emotions were flowing when the Dodgers call-ups were recently optioned back to Triple-A Albuquerque. I’m talking laying on a couch in a Snuggie with a tub of Haggen Dazs emotions. There were the guys in the locker room who were happy to get the daily starters back. The guys who were frustrated from being sent back down from Los Angeles. The guys who hoped they’d be the next ones to go be called up to the Dodgers. And then there were guys like Tyler Henson, who realized that despite how well they performed, their chances on the diamond were quickly vanishing right before their eyes. I sincerely mean it when I say “good luck,” as many games have seven of the eight (excluding the pitcher) available positions filled by 40-man roster players. Of course, who can really complain when the Isotopes are in first place and hit home runs as if they were Matt Kemp taking batting practice. Which, now that you mention it, is something we have witnessed. Either way, Henson has taken a realist approach when he examines future opportunities in the lineup. Put quite simply, he just wants a chance to play. When Henson first joined the ‘Topes from Single-A Rancho Cucamonga, the utility fielder came out hot and collected seven hits in his first six games. During that span, the outfielder also blasted two home runs in four contests. However, the streak proved to be short lived as Henson gradually cooled off to his current mark of .272. As a utility fielder that’s seen action all over the field during his six year career, there’s really no set position for Henson “to be at.” Through 36 appearances, he’s seen time at second, third, right, left and an occasional DH role. The versatility is absolutely an added benefit for Henson, but switching back and forth so often doesn’t allow him to become established in one role. One of the biggest reasons Henson has been able to stay comfortable throughout his career has been the continuous support of long-time teammate Matt Angle. Drafted only one year apart, Henson in 2006 and Angle in 2007, the duo has spent parts of six seasons together. And while there’s constant jesting between them (“I can’t get away from you,” Henson joked), Henson said the two have been able to rely on each other when the season begins to wear on the players. And as this year’s grind gradually comes to its conclusion, Henson plans to keep trusting his established routine to produce results. When he gets a chance, that is. Chances are, they will be.